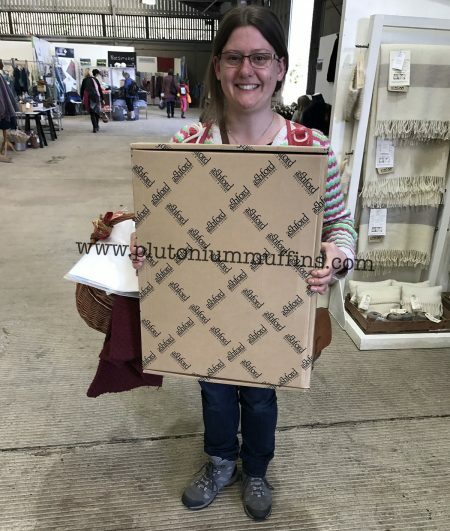 I had a hidden agenda while we were at Wonderwool Wales this year, and it ended with a major purchase. 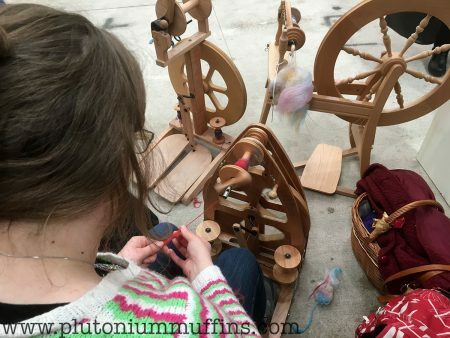 For years I’ve been lusting after a more portable spinning wheel than my Ashford Traditional. Every year I try out the wheels on various stands and tell myself “one year”. After a particularly miserable six months, and a renewed enthusiasm for spinning, I’d quietly and secretly decided this might be the year. For my previous blog on our general experience of Wonderwool Wales, click here. 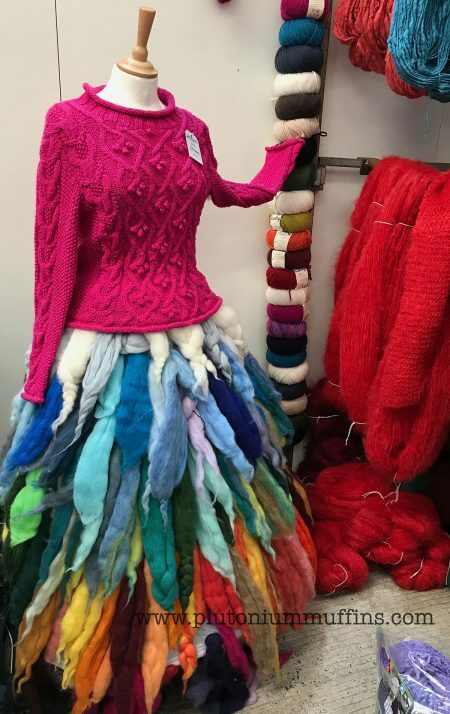 Woolyknit display – this was stunning, life size and wow I want it. 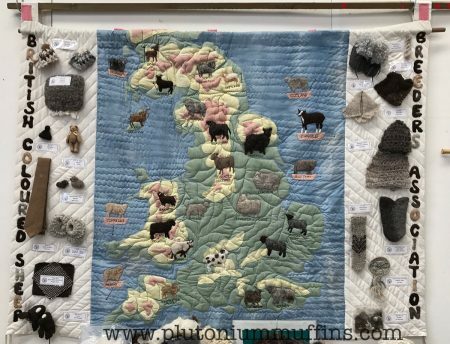 A quilted map of the UK showing all the coloured sheep in their locations. After lunch at Wonderwool, we walked past the Ashford stand and I asked Ricky if he minded if I tried out some wheels… One of the team gave me the go ahead to have a go, and I leapt in with enthusiasm. The first I sat at was the Joy, a double treadle wheel that you can fold and put in a backpack. The movement was a bit cramped and it didn’t help that the person who’d used it before had spun in the opposite direction to me. If you’re not a spinner, this basically means it was unravelling rather than spinning the fibre I was trying to feed on. I’d always thought this was the one I would love, but having tried it…no. Trying out the Ashford Joy at Wonderwool Wales. I wasn’t thrilled with it, so moved on to the Kiwi 2. This is a slightly bigger, heavier wheel. The speed they’d set it up to (it has six) was much better suited to my spinning style, and I felt a lot more comfortable. It also has a kiwi carved onto the right treadle, which although particularly idiotic as a reason to buy something, contributed. Although it doesn’t fold up like the Joy does, it’s much more portable than my Traddy. I made up my mind to buy one, and we went on the prowl! For those wondering how John reacted to me adding yet another spinning wheel to the collection….I called him first and gave him some time to think about it before making the purchase. He’s actually very pleased…because now he gets to buy a new music instrument! He also said “I know you’ve want this for years and you should do it.” I’m a lucky gal. With my new spinning wheel!!! My biggest purchase at a wool show in years. I put the wheel together the minute we got back home that night – you can watch the video here. Then I sat down to do some spinning, and I’ve been at it ever since. The wheel spins wonderfully, and I’m really enjoying working with it. There’s no doubt that it’s different, but in a really good way. 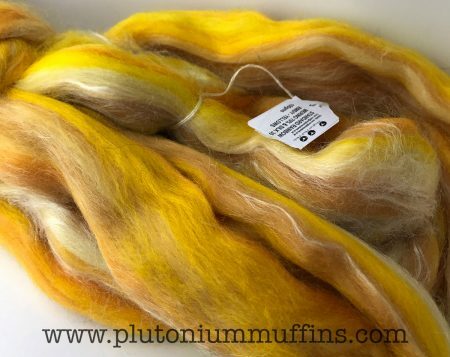 It’s definitely going to help with my ambition to get more adventurous with my spinning. Just a note on why I decided to go with the Ashford wheel, as opposed to another brand. One of the things I value in all brands is the ease of technical support and access to accessories. A well-known brand with lots of accessories that one can buy from most global locations, as well as plenty of interchangeability between equipment of the same brand, is something that appeals to me. These wheels may not be the prettiest, or have the most functions, but they’re affordable, good quality and very well known. 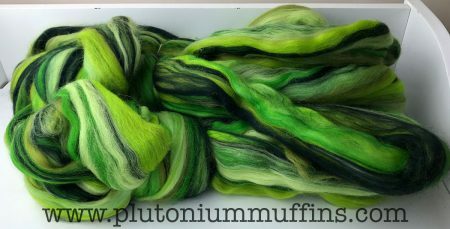 I’m going to go and make more plans for future spinning projects! This entry was posted in Blog, Spinning and tagged Ashford Joy, Ashford Kiwi 2, Ashford Traditional, fibre, Kiwi 2, Spinning, Wonderwool Wales, Wool. Bookmark the permalink. Fantastic big purchase! I need to try some wheels at a show next time because I would like a new wheel, but haven’t ever used any other than my Ashford Traveller. It is an older model and needs fixing, which I can’t be bothered with. I might as well get a new one and pass this one on. Great posts about Wonderwool! Thanks for sharing.